If you clicked into this article outraged by the title thanks for contributing to Thursday’s hit count. 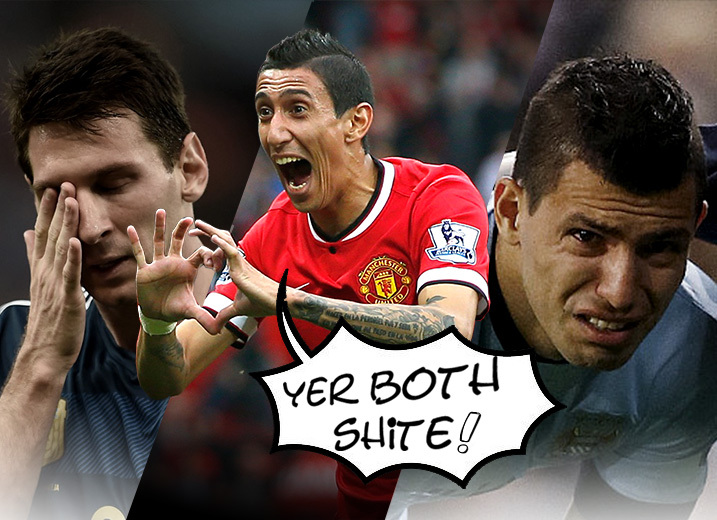 To clarify, not for one second do I believe Angel di Maria is better than Lionel Messi or Sergio Aguero. The meaning behind it – although I shouldn’t have to explain – is di Maria being named as the best foreign based Argentinian Player of the Year. It is one hell of an achievement with the award being single-handedly owned by Messi since 2007 with other players such as Ezequiel Lavezzi, Sergio Aguero and Javier Mascherano lower down the pecking order. Di Maria will undoubtably never quite get over missing the 2014 World Cup final against Germany through injury but this individual award will contribute as a cure. To try and justify such a triumph, di Maria played a major role in Real Madrid winning the Champions League. Such high level of form last season resulted in him becoming the Premier League’s most expensive player at £59.7m with a move to Manchester United despite interest from big spenders PSG. Louis van Gaal has missed di Maria’s excellence of late through another injury but he is expected to return soon. United are on their best run of the season winning 6 consecutive games, and with a player of his class return it’s only going to get better. Who misses out? Does di Maria deserve to walk into the team straight away? That’s a headache for van Gaal but one no manager in the world would mind having. Juan Mata has been performing well, popping up with goals and assists, but at times can be too pedestrian. The Argentine, however, is more direct and runs at defenders with lightening pace giving United a totally different outlet in attack. The team was a bit lost for where at the beginning of the season even with di Maria featuring regularly. We dropped points in games that should have been guaranteed wins but sloppy mistakes let us down. The players were also coming to terms with a new philosophy inflicted by a new manager which was always bound to take time. Also, during that period, we were playing relatively well but not always winning games. But now that we’re winning, the performances are below bar. It’s been all over the place in that respect. United’s next 13 Premier League fixtures are all winnable. What a position that would put us in for the last hurdle. Elsewhere, de manager, Robin van Persie and Daley Blind picked up awards at the 2014 Dutch Sports Gala. Van Gaal came away with Coach of The Year, Blind with Best Athlete and van Persie won Moment of The Year for his incredible diving header at the 2014 World Cup against Spain. The Manchester United trio all had a role in Holland’s moment of the year. To break it down, van Gaal selected the two players named above, Blind played a beautiful over-the-top ball to van Persie, who converted a perfect headed goal over Spanish goalkeeper Iker Casillas. Right now, the squad is made up of good chemistry. The January and summer transfer window markets are not too far away some even more strengthening with be done. I think we’re in safe hands under van Gaal and it was great to hear the fans against Southampton and Liverpool really get behind him and the team. Although, to be fair, our lot have been amazing all season. Beating the Scousers and receiving all these awards certainly qualifies for a good week at the office. Lets put Villa away this weekend and march into the new year strengthening our spot in the top four. Till tomorrow, keep that red flag flying.